Our fire extinguisher training London for your staff are an ideal way of teaching about fire safety and also complying the fire law. 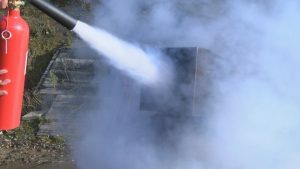 We provide in house fire extinguisher training course London sessions, off site and also open courses. So whether you need all of your staff trained or just a few persons, we have the right course for your staff. Our open courses are held every month or so in Southwark, South London. We take up to twenty persons per course and all are invited to tackle a small fire with our extinguishers. If you need more people trained we can come to your building and provide training in house. So what will your staff learn on our fire training programme? Practical session on all open courses. Optional extra on in house and off site sessions. This course is an accredited fire extinguisher training course. Your staff will get a training certificate and also online training notes. Remember, we are an approved fire training centre, so can make some changes to your in house course to reflect the risk and fire fighting equipment in your building. Booking a fire training extinguisher course with us is so easy! First tell us whether you need either an open course place or an in house course. We will give you our next available dates. Once we have agreed a date, we will ask for some of your details and also agree our terms. Once we have your details, your fire training course is booked. It really is that easy. For more information, either call or email us and we will be happy to answer any questions you have. For online fire extinguisher training click this link.